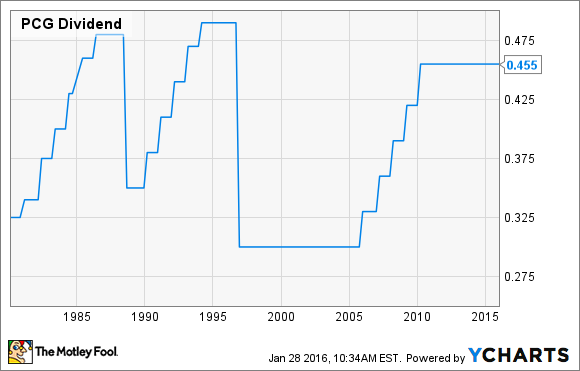 Will PG&E Raise Its Dividend in 2016? Will PG&E Corporation reward dividend stock investors this year? PG&E Corporation (NYSE:PCG) is a Fortune 200 company with 16 million customers. With regulated revenue pouring in, California's largest investor-owned utility currently offers investors a sizable 3.5% dividend yield, but it's unclear whether investors can expect bigger distributions in the year to come. Here are three considerations to help answer the question every dividend stock investor wants to know: Will PG&E raise its dividend in 2016? Precedent doesn't predict future performance -- but it's a start. Since corporate management has more control over dividend decisions than it does stock prices or earnings, investors can learn a lot from looking in their dividend rearview mirror. PG&E Corporation has a long history of steadily increasing its distributions -- except when it hasn't. During good times, the corporation has steadily inched up investor payouts. But when tough times hit, it hasn't been afraid to steady or reduce distributions. The last time PG&E increased its dividend was in 2010. That year, a San Bruno, Calif., natural gas pipeline explosion killed eight people and put PG&E on the defensive. FitchRatings estimates that between 2011 and 2014, the utility incurred around $4.8 billion in unrecoverable costs. While its tarnished reputation will live on for many more years following this sad disaster, it seems that PG&E has either dealt with or planned for all remaining related financial obligations. That could mean a dividend increase for the first time in 2016 -- but there are other indicators to consider. Every three years, PG&E hands over its books to California regulators for a general rate case funding request. Utilities are regulated monopolies, and the California Public Utilities Commission gets to decide what PG&E can ultimately charge its customers. PG&E submitted its 2017-2019 requests last September, and the commission will be considering PG&E's request throughout 2016. The utility is asking for an increase that would add around $4 per month to an average residential customer's bill. A decision could come as soon as the end of next year, and any indication one way or another could push PG&E Corporation toward or away from a dividend raise. It depends on its $29.5 billion rate base to deliver on its dividend, and any sign that the base isn't expanding could be reason to keep its distributions steady. PG&E offers a sizable dividend, but it also wants to spend its money on other things. One of the utility's most interesting expenditure areas is its "Grid of Things," which encompasses a variety of grid upgrades totaling $1 billion over the next three years. Regardless of where rate request conversation heads, PG&E Corporation will have to decide whether it can ultimately create more value for shareholders by distributing dividends or reinvesting earnings back into its own business. At current rates, PG&E already pays out over 95% of its earnings in the form of dividends, so it's counting on more money to do anything else. PG&E Corporation's 3.5% dividend yield is a tempting attraction for any investor, but shareholders shouldn't count on an increase in 2016. With a wayward past, unknown regulatory decisions on the horizon, and a variety of internal investment decisions thrown into the mix, bigger distributions might not be on the books. Investors who believe in PG&E's business might want to consider a long-term investment, but those looking for a quick increase in their own kickbacks should look elsewhere.